The Midland range of pet kennels. A quality range of pet houses for your beloved faithful friends. All of these building are constructed with tongue and groove boarding , topped off with green mineral felt and come with the option of additional floor bearers and a selection of paints to add that personal touch to your garden. 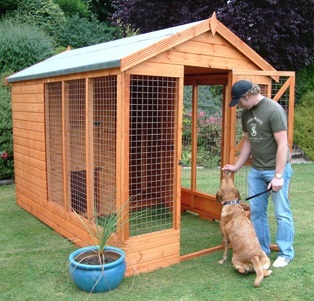 The Midlands Kennel and Run is available in 2 sizes and has the added option of being painted a colour of your choice. The Midlands Kennel and Run has the added option of being painted a colour of your choice and is available in 2 sizes. Fully installed if you are located in the green zone. There is an additional cost for delivery if you’re located in the blue or purple zone.